BEFORE YOU PURCHASE, PLEASE NOTE THIS IS AN INSTANT DOWNLOAD AND NOT A PRINTED PATTERN THAT WILL BE POSTED TO YOU. Please meet The Poppets. This is a pdf knitting pattern that will instantly download to you upon payment. There are lots of Poppets to meet, we have little girls and little boys. Wearing boots, trainers/sneakers or Mary Janes. Clothes included with this package are: pinafore dress, coat and hat, dungarees and hooded jacket. Wonderful for stash busting! They are knitted already wearing their smart striped sweaters and a choice of footwear. 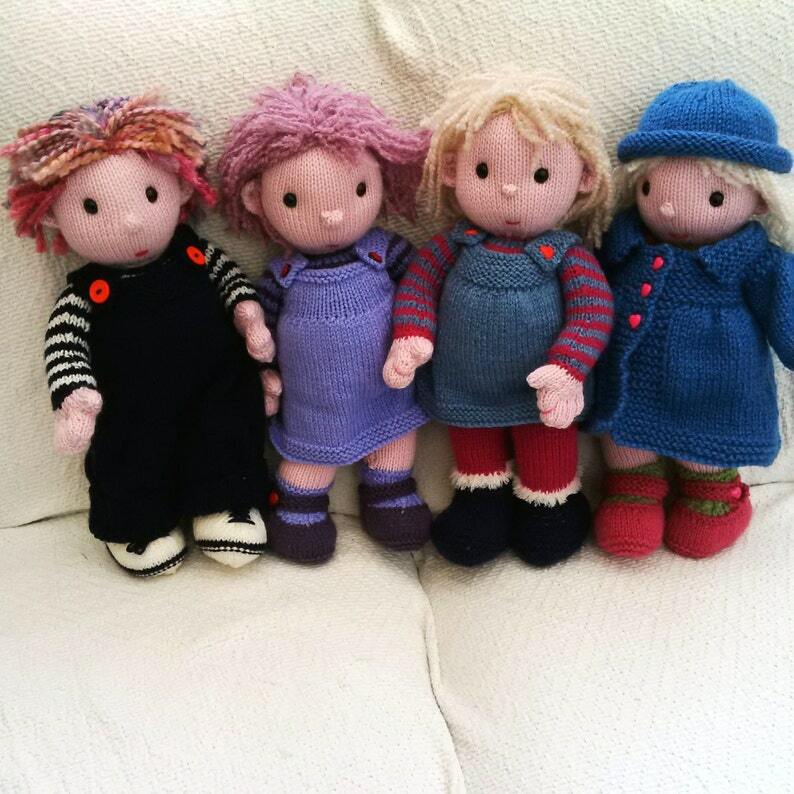 The Poppets are knitted on two needles, flat and constructed. The feet, legs, body and head are knitted as one piece. Arms, including elbows and thumbs and the ears are knitted separately and sewn on. Included with this pattern is a very detailed step by step guide to help you assemble your Poppet with lots of photos, hints and tips. A tutorial to help you with the hair is also included with this guide. Poppets can be knitted with either Double Knit/Lightweight Worsted or Aran/Worsted weight, needle sizes are included. The Aran/worsted weight Poppet finished measurement is 17 inches/43 cms. Because the Poppets are knitted with the legs attached to the body, they are able to sit and stand, making a very cuddly Poppet. Please note this listing is for the pdf knitting pattern, not the finished item. Due to the digital nature of this download, unfortunately no refunds will be given. So, so cute. Dying to get started. Many thanks for this delightful, well-written pattern.